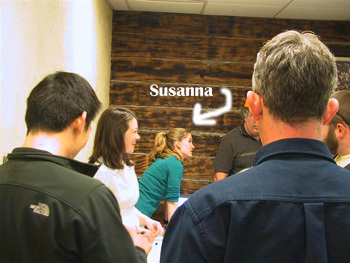 Susanna Musick took over the VIMS' portion of the VGFTP for Jon Lucy, so he can enjoy his retirement. Jon will still be working with the program as a consultant. 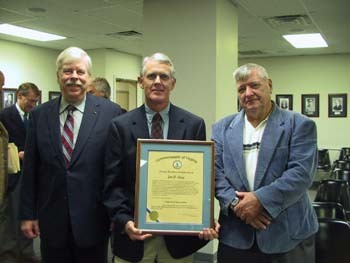 The Commission and Recreational Fishing Advisory Board presented a Certificate of Appreciation to Jon at the Commission meeting on 10/26/2010. 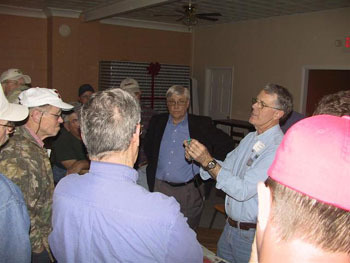 In the pictures below, Lewis Gillingham, Virginia Saltwater Fishing Tournament,VMRC, Susanna Musick and Jon Lucy, VIMS, along with some experienced taggers, hold training sessions for the new taggers joining the Virginia Game Fish Tagging (VGFT) program. 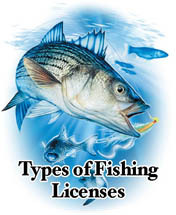 The program currently tags 10 species: black drum, black sea bass, cobia, summer flounder, gray triggerfish, red drum, sheepshead, spadefish, speckled trout, and tautog. 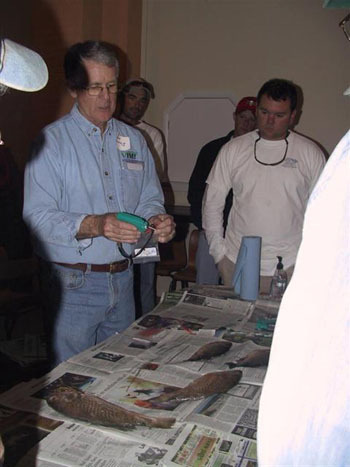 There are other tagging programs, so it is important to report the fish to the proper tagging entities. 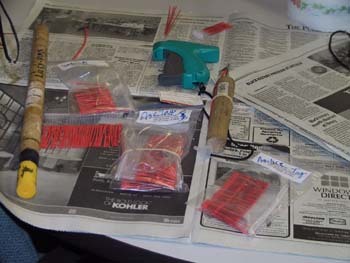 If you cannot read the contact information on the tag, Susanna or Lewis may be able to assist you with identifying the tagging program. Many offer rewards! 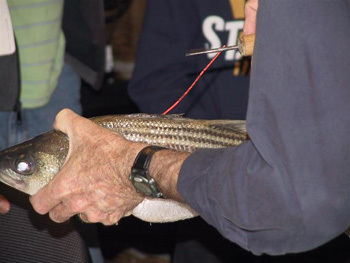 Call 757-491-5160 for information on what to do, if you catch a tagged fish. 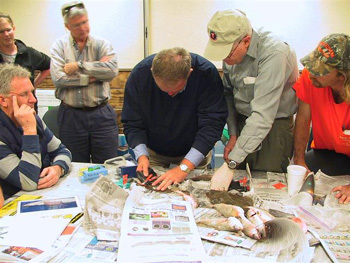 The best approach is to write the tag number down with additional information such as total length, condition of the fish, and catch location, and release the fish with the whole tag attached. 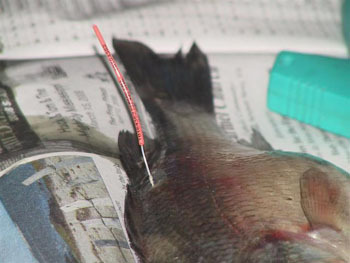 If you must cut the tag before releasing the fish, only cut the end tag number off and leave the phone number and second tag number in place. If you kept the fish or it died, please let the Program know. 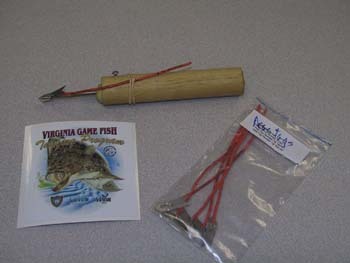 There is additional information and links to the printed forms on the main VMRC Game Fish Tagging page.